Stogie Commentary: Are Older Cigars Always Better? 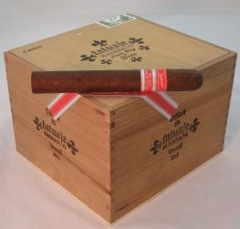 I’ve raved about the Tatuaje Havana VI Verocu No. 1 and No. 2 and explored the effects of aging cigars. So this is a little update combining the two. I’ve had a few of these limited edition Tats in my humidor for close to a year. While that’s not a particularly long time for aging, I think, based on those I’ve recently smoked, it has had an impact. Unfortunately, I have to report that, for me at least, even this amount of aging hasn’t been kind to these sticks. They have not become bad cigars. But the complexity and variety of flavors that set them apart isn’t present at the level it was before. And they just seem to have lost much of the zip that made them so special in the first place. Now, the truth is I wasn’t “aging” these cigars. They’ve just been sitting there, as do many of my smokes, while I more or less get around to smoking them. Nonetheless, I think it’s worth noting that although many cigars get better with aging, there is no guarantee. You may find that you liked the cigars better when you bought them. I think it’s well worth remembering the advice given by cigar aging experts: Smoke one stick from the box periodically to see how they’re doing. I’d suggest every few months. That way you can quickly speed up your smoking schedule as soon you begin to notice the changes becoming negative rather than positive. I agree that not all large cigars will get better with aging. Indeed, experience has shown me that the quality non-Cubans do not need much aging, if any, for a quality smoke. The big Cubans on the other hand, like the Siglo VI and San Cristobal El Morro do benefit from some aging. Mostly to get of the terrible,acrid taste of ammonia at the final 3rd when you have a young box. IMHO, Habanos has much to learn from Padrons, Illusione and Tatuaje on how to release quality cigars that are fantastic from the get-go. Oops – I have two unopened cabs sitting in the back of the humidor – you have officially gotten my day off to a bad start – lets hope the stock market goes up!! If I may, I would like to request that the stogie guys do a review on the Illusione vitolas or the new Cruzado range. They are simply fantastic smokes from the get-go. I agree that aging isn't always a good idea. Like you I think some smokes loose their distinct flavors and, for lack of a better term, zip. Hey isn't that why Noveau Beaujolais is a big deal in the wine world? i think it's interesting to note here that pepin (and i'm not sure where i read this, so don't take to much stock in it) has said he sees no reason to age cigars. and on the subject of beaujolais nouveau, its festival is on tonight in dc, so good timing. drink, my friends, drink. Yes, I think many Cuban blenders are not big proponents of aging. Interesting, since Cuban cigars lead the pack when it comes to smokers who seriously age cigars. Interestingly, the Padrons have always maintained that an oily cigar is just an indicator of insufficient aging during the production process. Thus, maybe these masters of blending feel that the producer, not the consumer, should do the aging. I guess the blenders in Cuba don’t have much of a say when the cigars may be released, even though they may feel it’s not ready. Perhaps that’s why the legends who have left Cuba like Jorge Padron and Don Pepin feel so strongly about this issue.